Dead Winter was one of my top favourite reads of last year. It told a really complex story with some really fascinating characters, each and every one of them. It was the story, you could say, of a train-wreck, but in the best possible sense of that word. We see the Skaven begin their plans to plunge the Empire into chaos by spreading a deadly plague throughout its various regions. With the Empire at its weakest, riven with internal strife and mistrust, they seek to move in and pick up the pieces to make the Skaven Under-Empire ascendant on the surface world as well. The primary focus of the story was on the lecherous depredations of Emperor Boris Goldgather, his right-hand Adolph Kreyssig who is essentially the commander of the Emperor’s security, a Skaven Plague-Priest named Puskab Foulfour, a Priest of Morr named Van Hal and and Graf Gunthar of Middenheim and his son Mandred. There are other perspectives in the novel of course, due to the great scope of the story, but in retrospect after reading Blighted Empire, these are the perspectives that are carried over and that become the connecting links. The novel continues the fall of the Empire. Emperor Boris abandons the capital Altdorf, leaving it in the hands of Kreyssig who immediately begins to lord over the nobles. He goes instead to the city of Carroburg where he intends to wait out the Black Plague with his Court, leaving the people to fend for themselves. In Sylvania, Van Hal is joined by Lothar von Diehl, a noble of the Empire who dreams to become a great necromancer himself. Over in Midden heim, things continue to deteriorate for the Graf and his son since their city is hit hard with the Plague and also has to contend with incursions from other evils. And finally, in Skavenblight, the eternal game of dominance between all the Clans continues as they all seek to outdo each other and Foulfur’s opponents too continue to counter his ascendancy. With all of this, Herr Werner sets the stage for things to get darker and worse for everyone involved, no matter who it is. Any scene involving Kreyssig and Goldgather absolutely stole the show. With the Skaven, you know that they are nothing but villains, but you don’t expect the same from the leader of the Empire, the man invested with its protection. But that’s exactly what happens in both Dead Winter and Blighted Empire. Boris Goldgather, so named because of his fascination with gold beyond the norms of common-sense and prudence, is running the Empire into the ground because he doesn’t take the Black Plague seriously and leaves the running of Altdorf to Kreyssig, a peasant he raised to such a high position. Together, they are a villainous duo who care for nothing except their own personal gain. And Kreyssig is even allied with the Skaven, who are using him for their own ends, sowing intentional mistrust and discord so that its easier for them to take over the city. With Boris in Carroburg however, we get to see a very different side of things, but no less terrible. The Emperor continues to make lives miserable for his courtiers, forcing them to new lows of humanity and decency while treating the people of the city as nothing more than dogs. It is a fascinating look into the devolution of nobles when faced with extreme adversity and an Emperor who revels in new and interesting emotional tortures. With each scene, Boris descends lower and lower until he eventually hits rock-bottom, and that’s when the true fun starts, because that’s when the Skaven make their final play and launch their invasion of the surface world, striking all over the Empire. With Kreyssig, we see how he digs himself deeper and deeper into the pit he made by allying with the Skaven. He throttles down Altdorf to establish his dominance over the landed nobles, wanting to prove himself their superior, and just as with Boris, he too eventually hits the bottom of the pit, and all his schemes and manipulations are laid bare. There is a subplot where he attempts to control the Temple of Sigmar as well, and its extremely pleasing to see it bounce back in his face in a most spectacular manner. Essentially, he finally meets his match and its fun through to the bitter end. Over in Middenheim, Manfred slowly but surely turns into someone the people can follow and look up to. In Dead Winter, we saw him as a raw youth who doesn’t understand the costs of power and the responsibilities of either his own office as the Prince or that of his father the Graf. It lands him in trouble again and again and each time he has to learn some hard lessons. We see more of that this time but with a much clearer arc and much better character development since Manfred has to take some of those harsh decisions himself. He has to be a ruler, a diplomat, and a lover, with everything that those roles entail. Most of all, he has to be true to his patron god, and in all of this, we see him pass through a Crucible. While I enjoyed his character arc in Dead Winter I didn’t particularly like him all that much. In this novel though, I both enjoyed his character arc, and liked him as well. But the best parts of the novel, undoubtedly were those dealing with the Skaven politics and the Skaven assault on Van Hal’s army of zombies. Van Hal isn’t exactly a POV character this time around, since we see his development through his apprentice Lothar, but I loved his scenes all the same because he grows into a really creepy villain through this book. In the previous novel, we saw how a humble Priest of Morr became a feared necromancer. In this one, we see that necromancer gain new heights of mastery and contend himself against some of the most powerful entities in the Old World, the Skaven being one of them. Lothar’s fascination and horror with Van Hal is a window through which we see how all Sylvania falls to the senior necromancer, and how he establishes himself as a villain to contend against for the heroes of this story, if there be such heroes of course. Through his work on the Thanquol and Boneripper novels, Herr Werner has become a master of writing Skaven characters and society. I haven’t read those novels, only some related short fiction here and there, but Herr Werner is someone who gets these duplicitous humanoid rats who are always conspiring against their peers and their betters, always seeking advantage where it can be had. The Skaven are one of the few truly unique fantasy races that I’ve come across in all my reading and Herr Werner’s writing crystallises that uniqueness. No more innately treacherous, paranoid and brilliant characters can be found in fantasy fiction I’d wager. Entertaining as always, the Skaven politics do make a twisted sense eventually, and the fun part is in seeing how each character works against the other and yet advances the goals of Skavendom everywhere. There are some threads from Dead Winter that are not dealt with in this novel, which is a bit odd, but does make sense later. The first novel established all the conflicts. The second novel builds on those conflicts. And the third novel due next year, Wolf of Sigmar I think it is called, is going to bring everything together into one big tapestry that tells the tale of the Black Plague, how the Skaven rose into prominence throughout the Old World, and then faded back into the shadows and become urban legends. 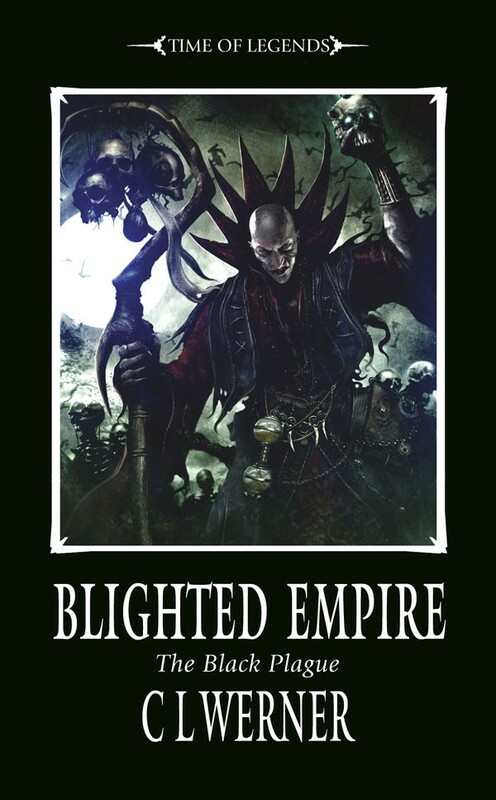 Blighted Empire suffers from some odd pacing issues here and there given all the characters involved and because a lot of the mystery within the novel isn’t made clear until much later on, but it is still one of the best novels I’ve read all year. Its not quite as good as its predecessor, but it is full of equally memorable characters and situations all the same. Herr Werner writes some truly satisfying action scenes and mysteries, all part of a greater whole and part of the charm of his writing is in how he slots everything together into a big puzzle that rewards the reader by the end. I really wish that this trilogy could be adapted into a graphic novel format. I’d love to see an artist’s rendering of all of this. Also, I’m tuckerised in the novel as Abin-gnaw Hakk, a Skaven of a rather murderous nature who gets two or three scenes in the novel and suffers a rather violent end towards the climax. The character was originally meant to appear in Dead Winter but Herr Werner couldn’t fit him in at the time. The genesis of the character lies in an old discussion on the Bolthole, a discussion about the Star Wars prequel trilogy. Herr Werner hates those movies, and I like them. My heresy earned me the violent death of a Skaven murder-rat in Blighted Empire. Its my third appearance in a novel, all of them this year, and I have to say that it is the most pleasing too. I was a minor character, but I made a difference in the fight to advance Skavendom across the lands! I definitely can’t wait for the next novel now! More C. L. Werner: Dead Winter, Siege of Castellax. Posted on November 17, 2013, in Book Reviews, Review Central and tagged Black Library, Black Magic, Book Reviews, C. L. Werner, Dark Fantasy, Emperor Boris Goldgather, Empire, Epic Fantasy, Fantasy, Knights, Lothar Von Diehl, Mages, Middenheim, Necromancy, Political Fantasy, Review, Review Central, Skaven, Tie-in fiction, Time of Legends, Van Hal, Warhammer Fantasy. Bookmark the permalink. 5 Comments.